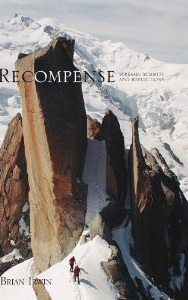 Recompense: Streams, Summits and Reflections is a compilation of essays, some of which have been previously published. Divided into personal, experiential pieces, regional, historical selections and fishing tales, this book is a collection of expositions that exemplify the humbling effect nature and culture can have on the human soul. A story of the loss of one of the world's great alpinists is contrasted by a recollection of a high-profile rescue high on Maine's Mount Katahdin and a two-year old boy's first rock climb. Cultural lessons learned during expeditions to Bolivia and Patagonia parallel interpretations of climbing and skiing's development in New England and the societal uniqueness of rural Washington State s trout fishing community. Recounts of intimidation in the intensive care unit and memories of fishing the open waters of Montana highlight the impact of the natural world on interpersonal relationships and their effect on the mind of a doctor in training. Recompense: Streams, Summits and Reflections is a balanced selection of essays that will delight readers.